Previously, on MinerBumping... Alfonse Layate sent EVEmails to CODE. 's gank victims, soliciting funds for a lowsec crusade against the New Order. In reality, Alfonse was an Agent of the New Order--conducting a sting operation designed to catch highsec rebels. 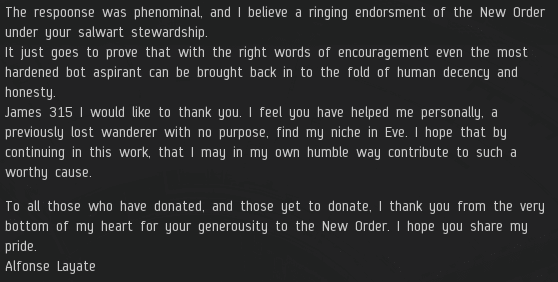 Despite having been ganked by the New Order in the past, the EVEmail recipients had the same obligations under the Code that everyone else has. They should have reported Alfonse to the proper authorities. They should have instructed Alfonse to cease his rebellion and embrace the Code. They didn't. Alfonse caught the rebellious carebears in the act. One such carebear, Leftius Maximus, claimed to be in a corp that "only does PvP". He got himself on the CODE. killboard by "engaging in PvP" on autopilot in an anti-tanked industrial full of blueprints. As is always the case with money-grubbing bot-aspirants, most were unwilling to part with isk, even for a cause they believed in. However, some of the offenders held enough of a grudge against the Order to pry a few isk loose from their own grubby hands. Money started trickling in. 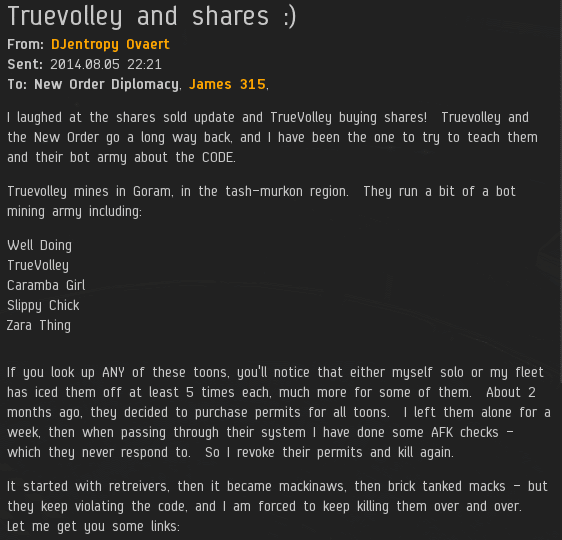 A miner named TrueVolley secretly donated a billion isk. His hatred burned hot. Who was this miner? 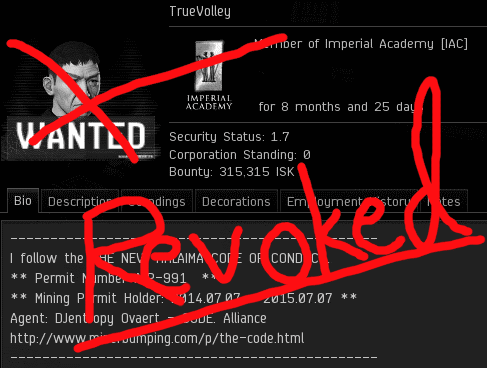 In a shocking twist, TrueVolley was actually a permit-holder! Despite his public declaration of loyalty, he had illegal feelings about the New Order. Alfonse's sting operation was bearing fruit. What an intelligence coup! TrueVolley and his army of alts are suspected of botting, and they frequently engage in AFK mining in violation of the Code. Their crimes get them ganked over and over. However, these days, even rebels know the only way to safely mine is to buy a permit. So TrueVolley and his alts keep buying permits. Skeptics and critics will tell you that the New Order only cares about extorting money, and that we'll let botters run rampant as long as they pay their mining fee. Not so. As TrueVolley learned, our Agents uphold the Code and punish the botters, even if they try to bribe us with insincere permit purchases. The CIA is known for engraving at its headquarters the words, "And Ye Shall Know the Truth and the Truth Shall Make You Free". Alfonse sought the truth. No matter how many layers of lies the carebears tried to hide it underneath, Alfonse found truth. There are many intelligence operatives working tirelessly for the New Order. They will continue to find the truth, and they will continue to set the carebears free: Free to follow every single word of the Code. Maybe we should make a KOS list for the worst Code violators, like a public top 10 with double reimbursement. 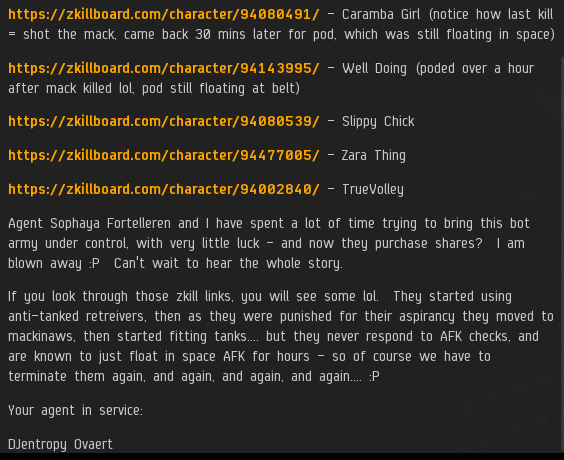 Provi has had a list for years (which I have been on for a long time for some odd reason), so CCP must endorse this idea. Well they might as well take you off of it. You know, since you tortured players. I didn't realise Slippy Chick was TrueVolley too. That brings his donation to 1.2 billion. What a lot of ISK to waste fighting such a pointless battle against such a superior force. Glad you enjoy the Blog. Why not take the next step and become an Agent? It's easy, and fun! As for the AT match, I totally join you in wishing our Team success. Agent Alfonse Layate, I salute your skill in uncovering the wickedness of these rebels. May you prosper in all you do! This is basically the most raw form of a Code victory there is. It's great to hear you're interested in joining the New Order! I would recommend a second account, since in that scenario you can train a scout on your main account, which is always handy. Once you can fit eight guns and some magstabs, contact John E Normus, he'll get you sorted out. Looking forward to seeing you on the fields of battle! Good to see you joining the good guys just like I did so long ago now. Without that chance encounter with James 315, I might not have gone down the same path as I did, which would have been a real shame. May your future as a hero of highsec be long and fruitful, and may you slay lots of bad guys! Who knows? You may have still been playing the game to this day! Hi Anon 2:31, and what good news you bring us! We pray for the speedy replacement of your router and look foward to seeing you in space! Second account? You don't absolutely *need* one, but I certainly found it a useful resource. I don't know about your skills, but Catalyst training is relatively quick. In the meantime, there are other things you can be doing for us; see 'Become an Agent', under the 'Agent' tab at the top of the page. Or, if you want an audio version, check out http://goo.gl/7iPULm, on SoundCloud. I recommend dual character training - one months gets you a very decent skill base, two months gets you a near-perfect Cata pilot, three months gives you all V in relevant skills. It's what I did for my ganking alt, and didn't regret it. Feel free to join the in game channel "minerbumping" (password is 315) and hang out and get to know us. Make sure, of course, to look over the channel rules - it's totally open to the public and all are welcome as long as they do not violate the channel rules! Don't bother joining minerbumping channel. I myself have been banned 6+ times! You propably lacked a channel permit. When you get an email, always read it. Completely. Hey, CODE. What ahppened to your fight today? Oh wait you chickened out after RvB banned both Catalysts and Talwars. No big suprise. Congratulations on excellent performance on Alliance Tournament! Did you guys have any ideas of the repercussions of that? Another proof: the CODE. doesn't shoot at things, that know how to fight back. The New Order has never lost a tournament of elite pvp. It's possible that serious violations of the Code were reported. In such an event, it's more important to enforce the Code than play a tournament. So you say CODE. 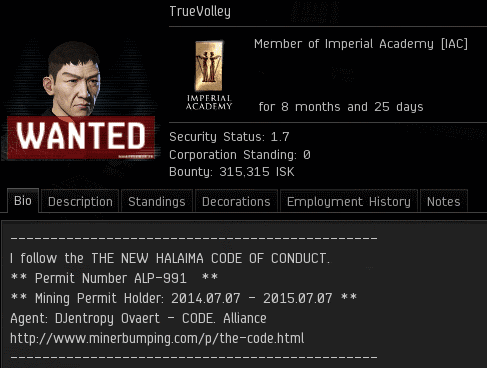 Alliance dosn't have the manpower to enforce the code, if mere 12 ppl are in combat? impressive! Please more dumb and sad (funny) excuses! CODE also never has wo a fight even in dummy pvp since running away dosn't count as victory. All the code tears that are flowing right now! Sweeeeet! Looks like the CODE signed up for RvB's bonus room. Hundreds of billions made in first match, trillions in 2nd with updated odds. Boy, if that's failure, keep it coming. Crying all the way to the bank. You just admitted, that code is manipulating all the bets. The Saviour sees all, including the future of every match in the tourny. Code is everywhere huh does that include the alliance tournamwnt? So what really happen couldn't get 12 people that could fly things other than catalysts?